KLY-TEK is a registered trademark, which is specialized in the development and the production of professional hand tools. Owned by the Turkish company Akdemir Makina, KLY-TEK aims to offer high quality products at affordable prices. KLY-TECH's products offer a variety of tools, ergonomic design and pass contstant detailed technical quality tests in all periods of production. All tools have a guarantee certificate approved by the Ministry of Industry and Trade, as well as CE, GS and TÜV certificates which assure of their customers a reliability and uncompromising quality. By improving the quality of their services and products, KLY-TEK has earned an excellent reputation and become a benchmark not only the local market in Turkey, but also in many countries worldwide. VIKIWAT Ltd. is a wholesaler and retailer, and offers a wide range of professional hand tools. In our online and offline stores you can find a wide range of hex key sets, hexagon socket sets, cases for professonal tools, ratchet wrenches, screwdriver tps and many other products from KLYTEK at competitive prices and with fast delivery. 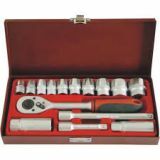 15 Piese 3/8” Hexagon Socket Set - Metric 15 parts set including a 3/8 ratchet wrench, extensions, screwdriver, adapters etc.